With mobile enterprise content management (ECM), productivity is no longer restricted to the cubicle. 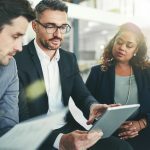 Employees can review, revise and work on documents, collaborate with others and participate in business processes no matter where they are – all within a secure and compliant environment. 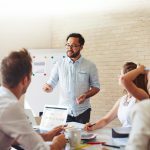 Here are five examples of how Laserfiche Mobile, our mobile ECM application, can revolutionize your organization. 1. The public services department at one city gets notified as soon as new graffiti is reported so that they can dispatch a cleaning crew. See how the city takes advantage of geotags in Laserfiche Mobile to make sure graffiti is cleaned up almost in real-time. 2. One city saves time and paper by allowing city council members to view the city council meeting agenda directly on their iPads. Read about how the city uses annotations to make viewing these agendas during city council meetings easy and painless. 3. Managers are accountable for their employees and departments even when out of the office. Discover how Laserfiche Mobile keeps managers in the loop by allowing them to participate in business processes and view business process history directly from their iPhone or iPad. 4. One construction company takes photos of trucks as they arrive at the construction site and sends them directly into Laserfiche. Learn how the company uses Laserfiche Mobile to prevent delivery fraud. 5. Laserfiche Mobile makes it easy to make sure only authorized individuals have access to the documents stored in the Laserfiche repository, even when a mobile device is lost or stolen. Find out how to configure Laserfiche Mobile security. Want to see more use cases for mobile ECM? 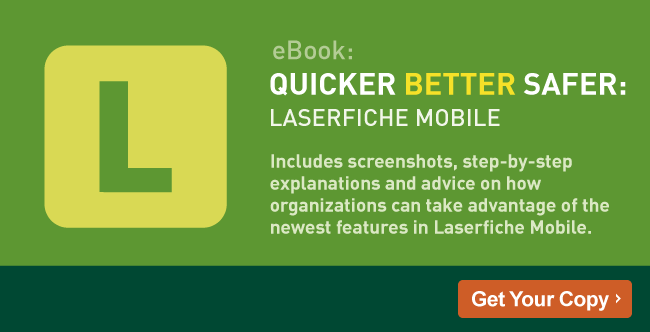 Download the free guide to Laserfiche Mobile.